This negative review was written by my estranged sister and published on a prominent wedding site under her name. 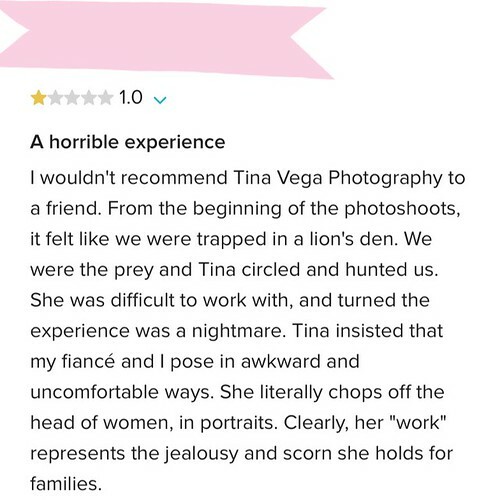 She is not a client of Tina Vega Photography. [For insight into this personal matter and to dispel misinformation being circulated about me or my business, click HERE.] UPDATE: WeddingWire attempted to verify the review by asking my sister to provide proof of payment or a copy of the contract; she had neither. The fake review was removed by WeddingWire but can still be viewed by way of Google for the time being.